Make a quick marinade by combining the soy sauce and garlic powder. Pour over ground beef and mix well. Brown ground beef over medium-high heat. Serve immediately with lettuce leaves. Note: to eat, just put a few spoonfuls of the meat mixture into the lettuce wrap. 1544 members have added this recipe to their cookbook. Absolutely delicious! The soy sauce was the perfect amount of seasoning. I added carrot and celery sticks to the wrap. Very filling. Cooking with sesame oil, and adding 1 tsp of chinese five spice greatly enhances this dish. Sprinkle filling with toasted pine nuts before serving - very good! I also added a tbs of ground ginger. The marinating is the key! I used ground turkey. Excellent taste!! I'll add veggies as needed. Awesome! I tweaked the recipe a bit. I marinated the beef with julienne carrots, soy sauce, garlic powder and Montreal steak seasoning. Then I topped each one off with thin sliced green onions(scallions- lots, as I LOVE onions), black sesame seeds, and SriRacha hot sauce!! It was a beautiful, colorful, delicious dish! Next time I will add mushrooms to the beef before cooking!! Sounds so good!! I used turkey instead, the flavor was delicious, I would definitely add more veggies to it. Great recipe! A tasty, simple and quick recipe. I added fresh garlic (why powdered?) and ginger to give it a bit more of a kick. I suppose, a bit of red chilli could work very nicely. In addition, I gave the mince meat a shot of Teriyaki sauce. For serving, I garnished each lettuce leaf with fine slivers of red onion. This one will definitely be included in the repertoire. I did add some ginger and some seasame seeds and some onion (chives) but yummy! Who needs PF Changs baby? I kinda modified this, I used the soy sauce and ginger, but added some stevia, garlic powder, sesame seeds, sesame oil and a bit of cayenne to spice it up. I served it with a bit of shredded carrot for color and green onions. my family loved it. next time I will double the batch or add some cooked lentils or something to make it go farther. 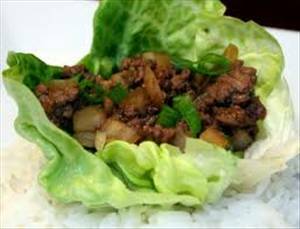 There are 340 calories in 1 serving of Asian Lettuce Wraps. Calorie break-down: 31% fat, 7% carbs, 62% protein.